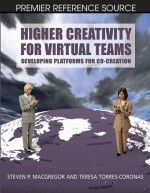 This chapter offers a spatial concept of the way virtual design team work. It is concerned with two problems that face creative teams today: (1) that the design process is carried out through a diverse range of digital media, which are not or only poorly integrated and (2) that the digital tools used by virtual teams are not designed for virtual team work but used in a very pragmatic way, which often limits the creative efficiency. The chapter argues that space has a structure and that we can use that structure to navigate and place information in space and thereby create a design space with the virtuality and creativity of an open ‘reflection-in-action.’ Further, it argues that we have to develop concepts of team setting, team solving, substituted process paths, and supplemented process paths to expand our understanding of these issues. This will be demonstrated through two constructions for virtual teams: virtual platform and topos.